Yeah. I am going. See ya there? Yeah, I cant stay long but I'll come grab a burrito. oooh, can I get a sticker? To get us back on topic, you can check out my BBS wheels. Likewise, mwscircle will be there too. He has BBS LMs as well. And I am texting Khoa right now. 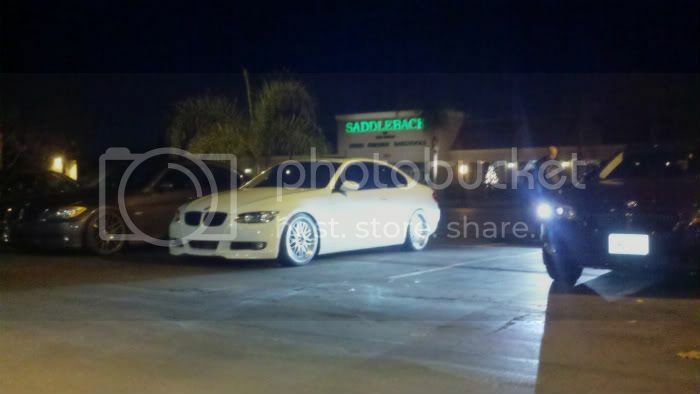 He has 20" BBS LMs on his M3. He might be there. If he brings the 330, he has BBS wheels on that one, too. So, it's a BBS meet, baby! Be there around 6:45. EDIT: Khoa just confirmed. He'll be there too. Should be a good turnout. Say hi to nathan for me. Hehe - I was actually reminiscing back to the days of the BBS's (bulletin board service using dial up) - before the internet - when we had BBS meets and swap meets...those were the days. Have fun guys! Hope you took pictures. I'd come out in my e30 rocking some basketweaves but you are on the other coast. Mwscircle runs bbs basket weaves on his E30. He brought his 335. Otherwise I would snap some pics. My BBS wheels tonight -- taken with the Droid. What is that Saddleback place in the background? It's a company that sells patio equipment.